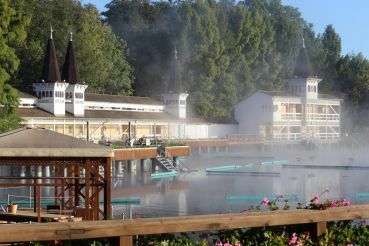 Lake Heviz is one of the wonders of Hungary and the largest thermal lake in Europe. 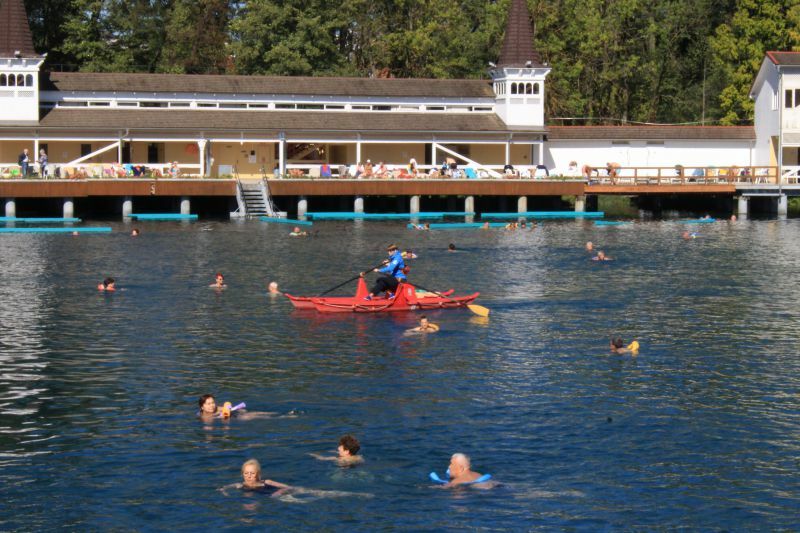 More than a million tourists come to the healing waters every year! This is the most visited place of Hungary after Budapest. 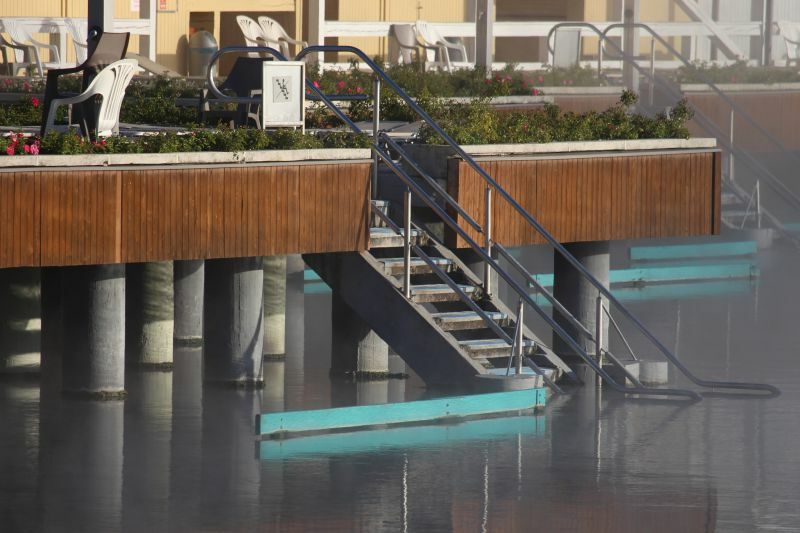 And that’s not surprising: warm thermal waters heal from many ailments, help to maintain and strengthen health. A small town with excellent infrastructure is built right at the lake. Moreover, this is the land of pink lilies and bright colors! Origin. 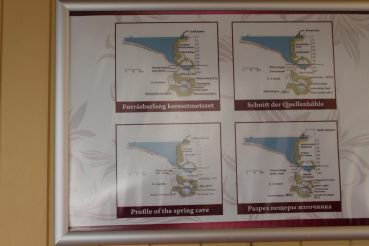 Heviz is an ancient lake which appeared thanks to the basaltic mountains towering near Balaton. 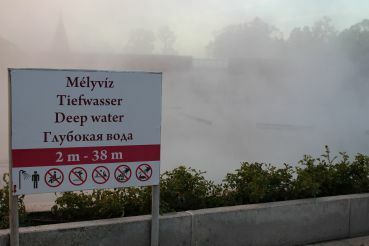 According to philologists “Heviz” means “flowing thermal water”. Legends. The miraculous power of lake waters has been used for more than 2 thousand years! 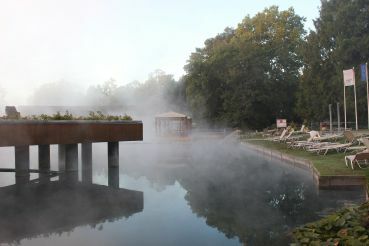 Even the Romans noticed that the thermal lake helps to heal. The legend has it, the source that feeds Lake Heviz started to well out during the days of Roman civilization. The nanny of the paralyzed child prayed the Most Holy Virgin to cure his illness. Prayers were heard: a miraculous source appeared which saved the child from the illness. This child was the future emperor of Eastern Rome, Flavius Theodosius. However, according to research, this lake’s history begins with the ancient Pannonian Sea. 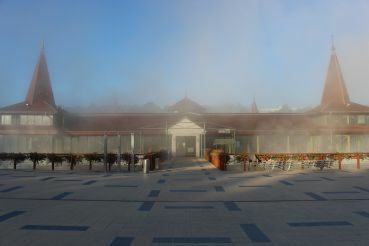 First thermal baths. For the first time, a research study of water was conducted in the mid-18th century. 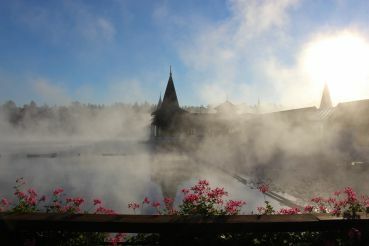 It was decided to create thermal baths on the miraculous lake. Count György Festetics who put a lot of effort into developing the resort was involved in the construction. Heviz, however, became widely known only in the early 20th century when the owner of the brewery rented it. He approached this with typical for him entrepreneurial mindset. Famous doctors were invited to develop new methods of treatment and prevention. Rumors of miraculous healings spread throughout the country. 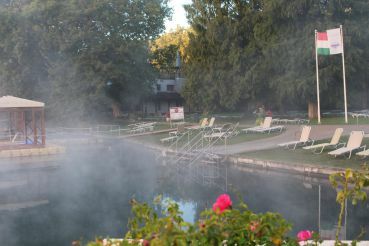 In the early 20th century, Heviz became the most famous thermal spa of Hungary. And it remained that way until the beginning of the Second World War. When it ended, the baths were nationalized. 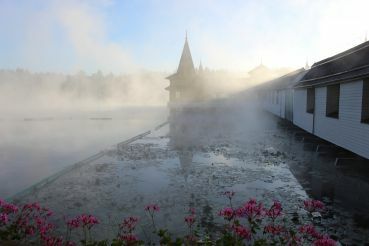 A specialized clinic for the treatment of rheumatological diseases was built on the shore of the lake. 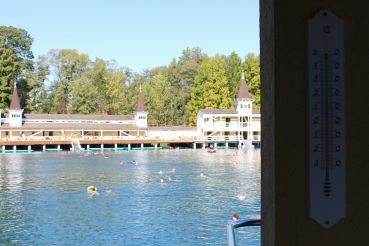 Baths were reconstructed in 2005: a modern health center was created on the lake as well. Every year more than a million tourists come here. Among them, about half are Hungarians, a third are Germans, and another third are Ukrainians and Russians. Lake Cave. The lake water completely replenishes itself every three days. For a long time, the source of Lake Heviz remained in secret. In the mid-19th century, the baths were once again rebuilt, and measurements were taken. When the measuring instrument was submerged to find out the depth, the rope holding it broke from overstrain. That’s how the source which is 38 of water depth was discovered. The lake is funnel-shaped. For quite a while, it was impossible to work at such a depth: just too dangerous. Only in the 1970s divers finally saw the source. The power of the lake lies in the 16-meter cave which is located at a depth of 41 meters. 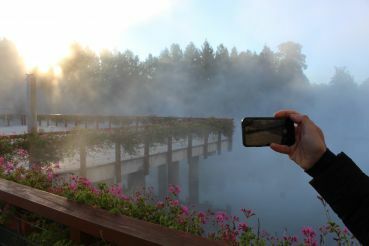 Thermal springs of different temperatures mix together and reach a temperature of +38 C. Then they flow along the “corridor” to the top feeding Lake Heviz. Therefore, the water in Heviz is always fresh and flowing! 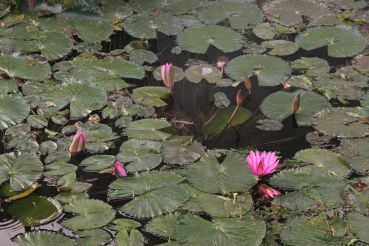 Water lilies. 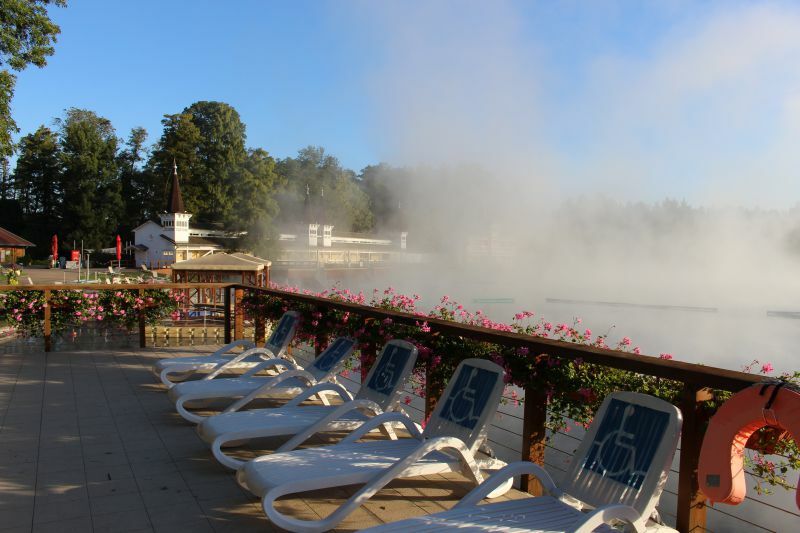 Swimming in the turquoise waters of the thermal lake covered with water lilies – this is possible only in Heviz. 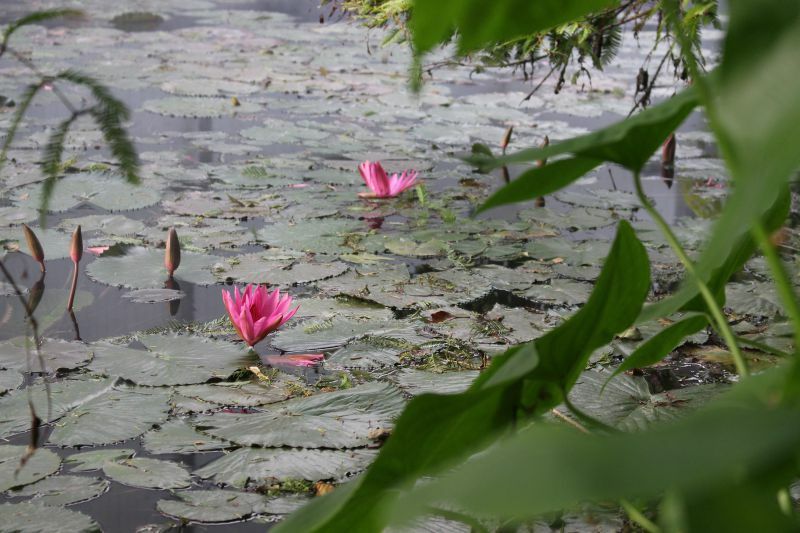 White, pink and purple lilies have become constant residents of the amazing lake and that’s because in 1898 one professor brought lilies and water lilies to the city. Amazing flowers took root and became a symbol of Heviz! 4.4 hectares – lake surface area. 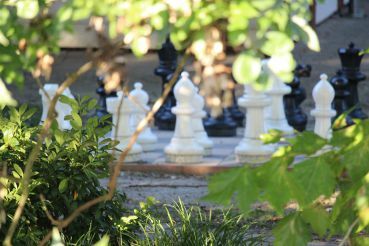 38 meters – the source depth. 72 hours – full water replenishment. 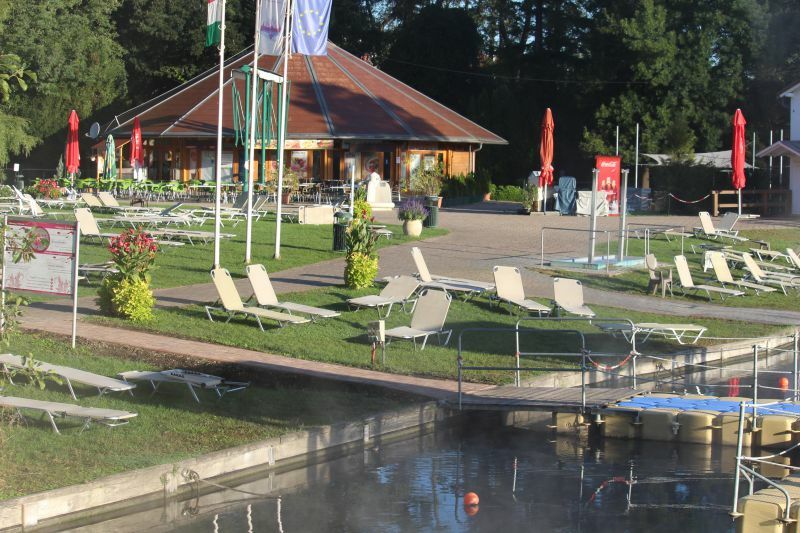 + 23–25 degrees – water temperature in winter. 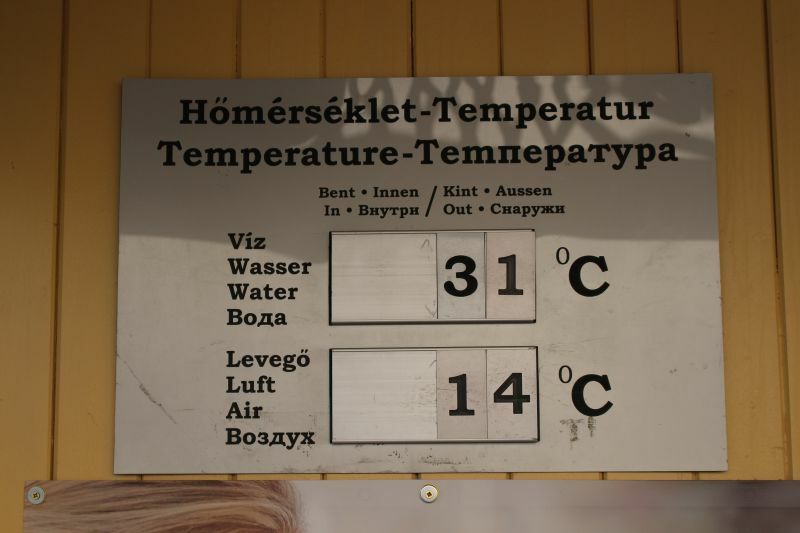 + 33–36 degrees – water temperature in summer. 5600 years old – age of lake water. 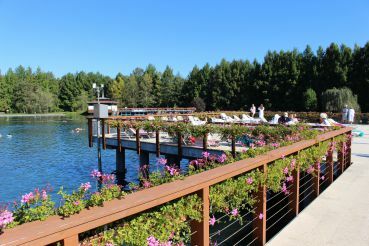 An entire resort city with swimming pools, changing rooms, a beach, and relaxation areas was created at the lake. And it’s full of flowers! One should come to Heviz not only for treatment and spa procedures but also for some rest. 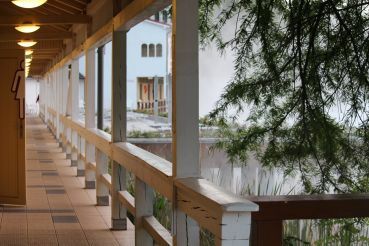 The complex has many saunas (for instance, salt ones), ice caves, Jacuzzi tubs. Even the smallest of details are carefully thought out, everything is very convenient: people with disabilities will feel comfortable here. During the cold season, there is no need to go to the lake down the street: paths right from the complex lead straight to the lake. Those who like it hotter can enjoy indoor pools. Their water temperature is much higher than in the open ones. 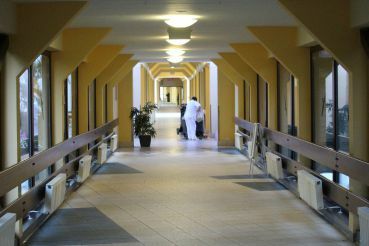 It is also very easy to swim out outside through special corridors with transparent walls. For the sake of convenience fun swim rings are issued to guests. There is also always a lifeguard to ensure safety for everyone. 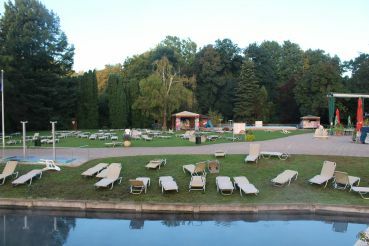 During the warm weather, you can sunbathe on a sun lounger at the summer bar or relax on the lawn. Recreation complex offers bars, restaurants, fitness center, children's playground. 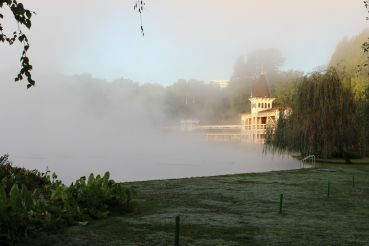 The Festetics family commisioned sculptures of two cherubims were installed near the lake to ward away evil spirits. They also can be found on the city’s coat of arms. Spine, bones and joints problems (rheumatic, osteoporosis, arthrosis, inflammation, fractures, injuries). Gastrointestinal tract problems (chronic gastritis, colitis and enteritis). Children under 14 are not allowed to spend a lot of time in the water. 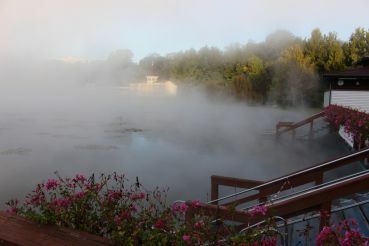 Visitors can make an appointment or get treatment in the St. Andrew's Rheumatology Hospital that is located at the lake. A wide range of procedures is offered both in the health center itself and in the clinic and hotels. 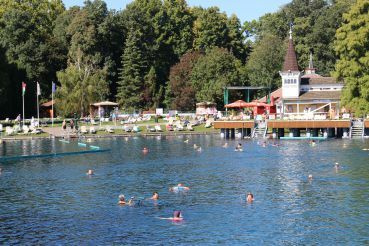 You will feel that the water in the lake is unusual after the first 10 minutes of swimming. It feels like your chest and throat are being squeezed! This enriched with minerals water really exerts hydrostatic pressure, improves blood circulation. It is not recommended to swim for more than 30 minutes at a time. After that, you should take a half-hour break. Of course, if you have a chronic disease you need to consult a doctor first. However, if you are not worried about health, do not be afraid of the power of water: just follow the “30 minutes” rule. If you came for treatment, the optimal time is 14–21 days, although the duration is determined for every person individually with the doctor. You should get examined in your place of residence and come here with the medical report. You can get consulted in Heviz. Weight baths. This is lake’s calling card and the main method of treatment. It was invented in Heviz in the 1950s. Such baths help with lower back and spine problems. Mud therapy. The concentration of nutrients in the peat mud that covers the bottom of Lake Heviz is even higher than in the water. That’s why mud application is popular. Hydrotherapy. 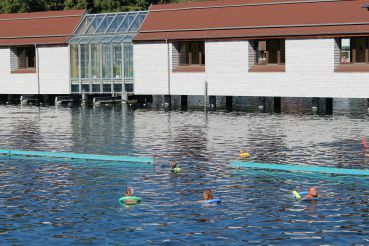 The clinic and some hotels have pump rooms for lake water. It helps with digestive system problems. 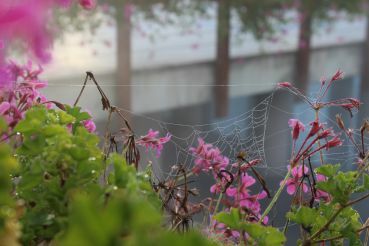 The most favorable time for treatment is considered autumn and spring. In the summer, hot weather comes to Heviz. The air warms up to +35 degrees. 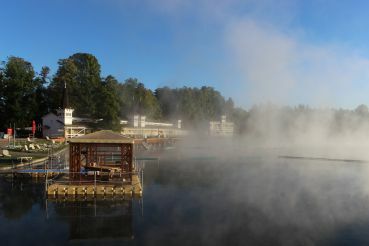 The thermal Lake Haniz heats significantly. People suffering from high blood pressure and cardiovascular diseases are at risk. In winter, the temperature never drops below +23 degrees. 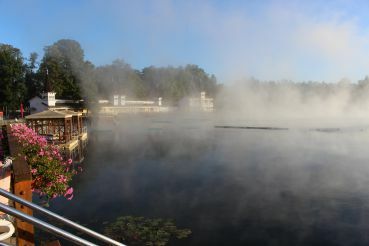 A steam cap covers the surface of the lake, which prevents the water from cooling and serves as a natural inhaler: vapors are useful for the respiratory system. 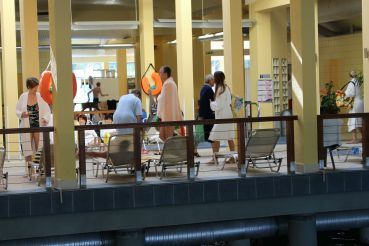 If you do not want to swim in the open air, there are indoor baths. 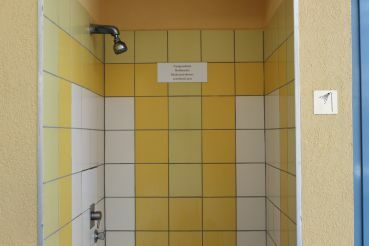 Inside you will find several pools the temperature of which is + 32–37 C.
Bathrooms open 9:00 and close at 17:30. 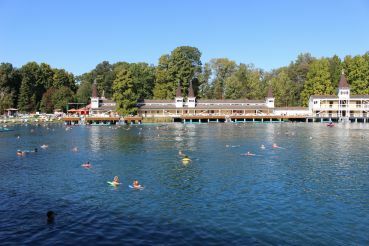 You can swim in the lake until 17:00, the ticket office closes at 16:30. Price depends on the duration of stay and additional services. 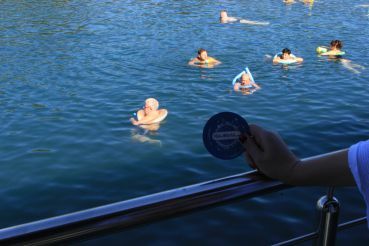 Tickets to the lake in Heviz can be bought at the entrance to the baths, special season tickets can be purchased at hotels. 3 hours – 3000 forints. 4 hours – 3700 forints. Single day – 5200 forints. 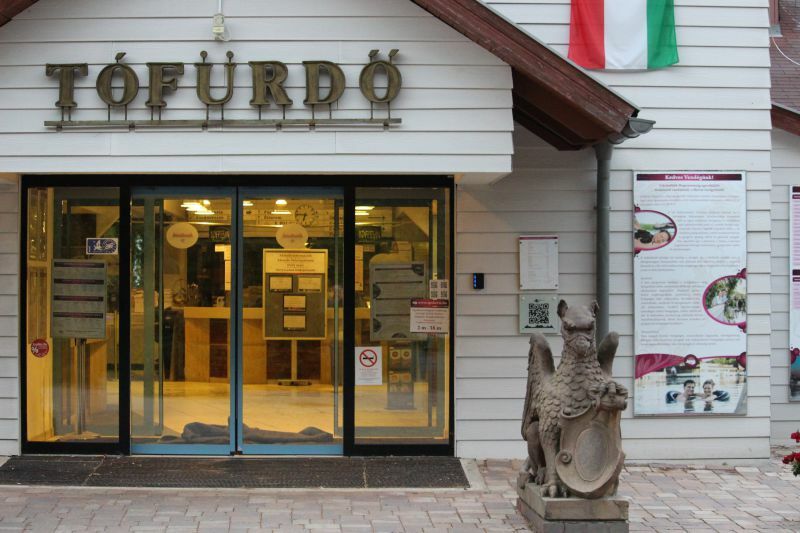 Children's ticket for 3 hours (6–14 years old) – 1600 forints. Children under 6 years old – free of charge. 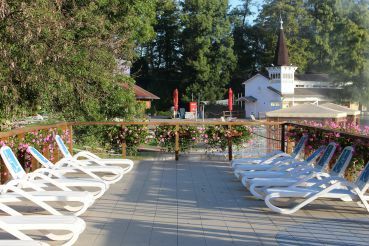 Sauna ticket (optional) – 2,200 forints. From Hévíz-Balaton Airport. The nearest airport is just 13 km from Heviz, in Sarmellek. In the warm season, there are regular and charter flights. Most often – from Germany. 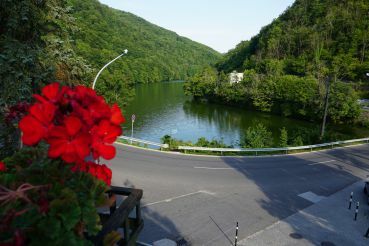 Travel companies and hotels help to transport guests to Heviz. It is possible to rent a car or bus. From Budapest. The cheapest way is to get there by bus. When leaving the airport, you need to find a bus stop near Terminal 2B and take bus 220Е to the Köbánya-Kispest subway station. Next, take the subway to the Népliget station where the Népliget Bus Terminal. Buses to Heviz run from 7:30 to 19:00. The price starts at 2,200 forints. The ride will take around two hours. Follow M7 highway if you’re traveling by car. From Vienna. The distance between Vienna and Heviz is 200. You can order a transfer or take a bus. If you go by car, the road will take about 2 hours on highway 84. By train. 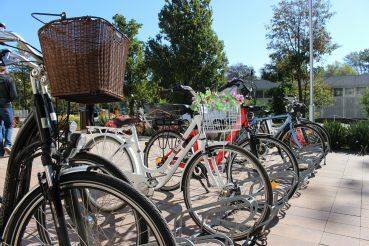 Unfortunately, it is impossible to get to Heviz by train, but you can get to the nearby town of Keszthely which is only 8 km away and take a bus from there. Getting around the city. The most convenient way to get to Lake Heviz is to rent a car. If you don’t want to rent anything, then a tourist “train” will take you to the lake; it costs 1000 forints. 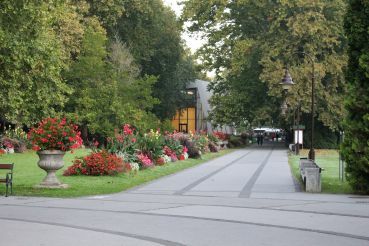 Or you can walk on foot, the city is small, it takes 15 minutes to go down the main Rákóczi street to the lake.